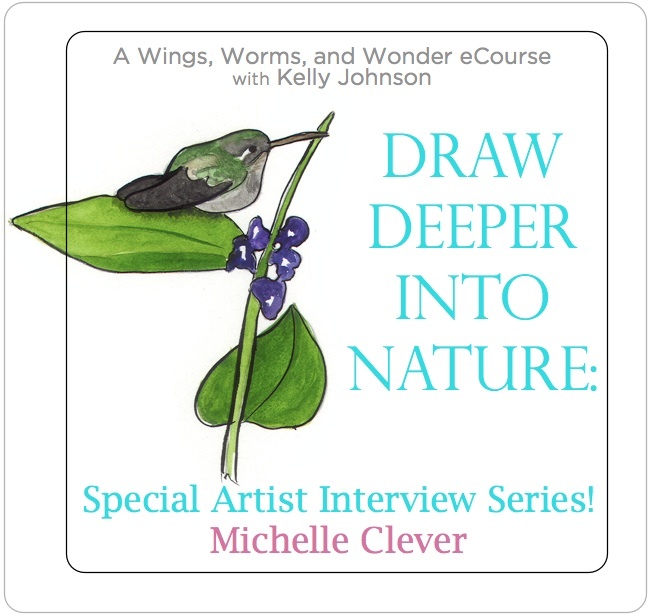 Welcome to day 4 of the Draw Deeper Into Nature Special Artist Interview Series! 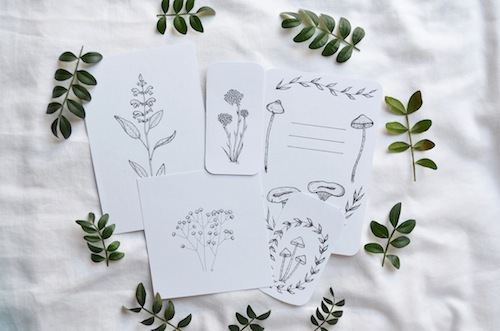 This week we are getting to know a little bit more about some of my favorite nature inspired artists working and creatively connecting through art everyday! aka Daughter of the Woods! She is also from west Germany (looks like Germany is doing something right!!) 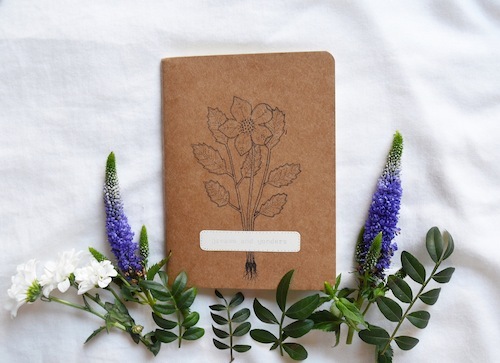 who connects with the beauty of her surroundings through her nature journaling and nature inspired art and music! I also discovered Michelle on Instagram and look forward to her fairy-tale forest nature pictures everyday! Let’s get to know Michelle!! 1. What aspects of growing up with so much access to nature do you think inspired your creative connections with nature? Well, the fact that I grew up near the farmsteads and fields had the affect that I spent a lot of my childhood outside, running through the grass. Playing with the neighbour’s children in the garden and after all those years now, I also realized that this calmness a life at the edge of the town provides made me a very thoughtful and harmonic person and inspired my interests I am passionate about now. Although I realized what nature hides and how much magic it contains only a few years ago, when I’ve stuck in the identification process and found my way to the conscious and slow way of living. But for my own children I would love to share my love for nature with them. I want them to grow up in a surrounding full of wild beauty and a connection to the earth. I hope I can realize that one day by moving into the countryside of Scandinavia. A slow way of living is so important in the rushed world. We do have to make time for it and remember that children need slow. They need to run in the fields with friends like you did and explore and play outside if they are to build a love of nature and creativity when they grow up. The country side of Scandinavia seems like a wonderful place to make a life. I am visiting there this summer and can’t wait! But then again, your description of west Germany sounds pretty fantastic too! 2. How does your interest in literature and medieval culture influence your nature art style? Literature is a door to a lot of different worlds full of inspiration, magic and dreams. My love for books has let my love for different epochs grow and inspires it everyday by reading classics like Jane Eyre or watching historical movies. Sometimes I think I am born in the wrong century because my passion in old times is so intensively. Moreover I think that people took more care of nature in the past times and learnt from it, explored what the earth is giving to the humans instead of exploiting and destroying it. The living in the past has been much more conscious and I love to travel in time for a while through books and movies or even medieval fairs and experience this consciousness and knowledge. It does seem like in the past people respected and cared for nature more because they knew their survival depended on it, but now even though our survival depends just as much, cultures seem to have forgotten the respect and importance. Often I think I am born in the wrong time too! 3. You live in your hometown and your deep connection to the nature of that place shines in your art. 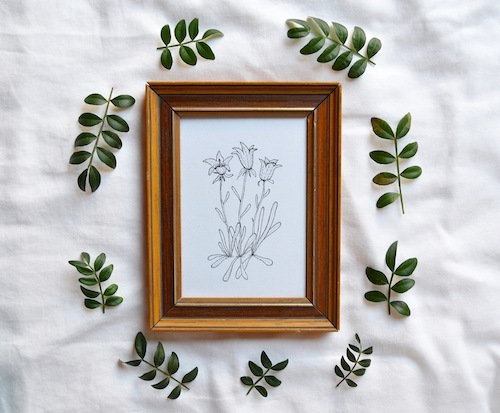 Do you think making nature art has given you this deep special connection to the wonders of your home. It definitely did! Especially these days when spring is arriving and everything is blooming and coming to life again, I see so many wonders I haven’t recognized before. All these years I was blind for all this beauty out there but now I recognize every little flower and tree, every blossom and beautiful spot around me. Even when I am on train to university or on the bus to the city and I pass a cherry blossom tree or a forest full of birches I take a second look and am so happy to finally be able to see all this magic which most people just ignore. It is so easy to become blind to the beauty and when you realize that and open up your senses to it what a world of wonders!! I think sometimes when we are younger we take the beauty around us for granted because we are kids, but once we realize how special it is, nature will give us gifts everyday. 4. What are your favorite art supplies and materials to work with out in nature? & Do you make the drawings for your jewelry and stickers in nature or make sketches outside and finals in your art space? Well, I use a lot of different stuff because I haven’t find my specific way of art and working yet. But at the moment I love to use the Winsor &Newton Watercolor and some very amazing thin liners from Muji. I recently fell in love with brown board to draw on! I think your way of working is beautiful! I do definitely understand wanting to try new things in art too. Why limit yourself when there is a world of creativity out there waiting! I often take photos or make sketches outside but come inside to my art space to make the finals or to add the paints – also listening to music! I also love Winsor& Newton watercolors and brushes and I am curious about the Muji liners now! 5. What’s your favorite smell in nature and is there a story why? Oh, that’s such a hard question! There are a lot of smells in nature I absolutely adore and connect with a lot of memories. Every season has its’s own smell and which causes some blooming in my heart and mind. I love the moment when I open the window in the morning and it suddenly smells like winter for example and I just have to smile because it reminds me of all the winter I already experienced with all its memories and adventures. The smell of summer and winter are the most intensively ones for me, cause it shows the strongest seasons- Scents are very important for me and will always be. And I enjoy the variety of these wonders every second. Close your eyes and you will experience a wonderland of colors through your nose. Me too!! My favorite smells are that of summer and winter. I like all the seasons, but I especially like how winter and summer really know what they are. Scents are very important to me also, that’s why I am so curious about this and always ask people. They are such powerful connectors and can take us to different places and times in our minds and bodies. I love how you say a wonderland of colors through your nose. It is SO true!! Comment on every post interview this week (May 16-20) to be entered to win a free spot in Draw Deeper Into Nature! Winner announced Monday May 23! Hej, my name is Michelle, I am a twenty-two year old young wanderer from Germany. 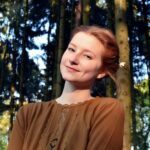 I am studying Literary and Cultural Studies with philosophy and sociology at the moment and will soon spend my study abroad in Finland. I am a creative mind, explorer, bookworm, writer of letter, artist, lover of the north and nature child! I love to spend my free time with my head in the clouds or in a good book, dance to happy tunes, draw my dreams or walk through the world full of adventures. I enjoy experiencing different countries and cultures and to meet all kinds of people. In my future I hope I can travel the world before putting roots in the Scandinavian wilderness, working at a magazine or with animals and plants and having a small vintage-vegan shop with homemade treats, lots of books and nice talks. Until then I continue living my own little fairytale. When and where did you realize that nature hides magic just waiting for us to discover it? 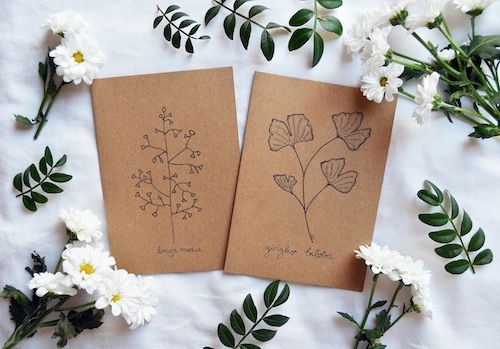 Or if you are new to nature journaling, Watch info videos and register for Draw Deeper Into Nature and the Draw + Draw Deeper Bundle here! 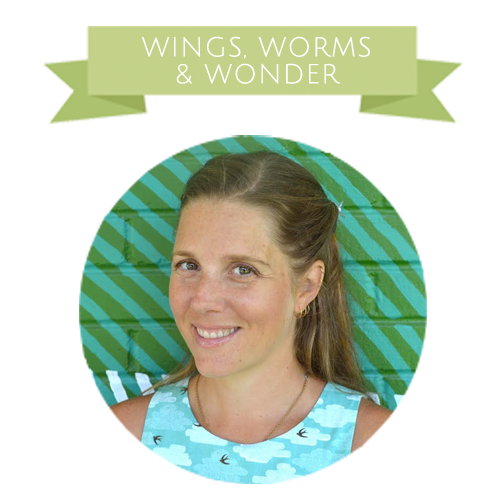 The Draw Deeper Into Nature eCourse Starts May 23, Registration closes May 28! Thank you so much for sharing. That is so wonderful that nature helped you through that difficult time. Such a beautiful story. I love the smell and the feel of the air that tells you rain is coming. I love booming thunder that shakes the house (terrifies my dogs). I sit out on the screen porch in my bed and feel the energy, terrifying and beautiful at the same time. I love the deafening orchestra of the spring peepers and pond frogs accentuated by the unmistakable bass note “boink” of the bull frog. YES! Nature is always there waiting for us to creatively connect! I like to call it listening for nature’s whispers. The bring so much wonder and magic to life when we open up to seeing and hearing them. It has just been in the past year that I have really noticed the magic and wonder of nature. We had a very stressful spring and summer last year that lead up to us moving away from friends and moving in with my inlaws in rural Alabama. As a way to keep the 3 kids entertained we started spending hours each day exploring the property. Really focusing on the same spots as the seasons changed and seeing things through my little ones eyes was amazing. Right now I am obsessed with clouds (thanks to Dawn at Mud Puddles to Meteors). I look at the sky, at how beautiful the clouds are and wonder how I didn’t notice sooner! As a child I realized that nature hides magic inside the branches of our beautiful, giant weeping willow tree in the backyard. It became our play house, imaginary castle, fairy garden, etc! My brother and sister spent hours there playing, creating, reading and drawing. I loved it! I love that visual!! And the seeds the tree and the experiences planted!